As well as bringing you news of brand new apps we also like to keep readers informed about app updates that often bring some real improvements. One such app is the Facebook iOS app that received an update yesterday to take it to version 5.6 and we have details of the app and change log of the latest update. Facebook seems set in its bid to continually improve users’ mobile experiences and the Facebook iOS app enables users to keep in touch with what their friends are up to, share videos and photos and receive notifications if their friends ‘like’ or comment on posts. Many people also use the Facebook iOS app for gaming and some choose to have group conversations. The app is free and compatible with iPhone, iPod touch and iPad running iOS 5 or later and has been optimized for the iPhone 5. Users must be over 13 years old. Changes with version 5.6 include being able to keep things fresh with the ability to change your cover photo while out and about from within the app. You can take a new cover photo or select from the camera roll on the iPhone and you also need less taps to begin group messaging. As well as this the update makes it easier to find group conversations. 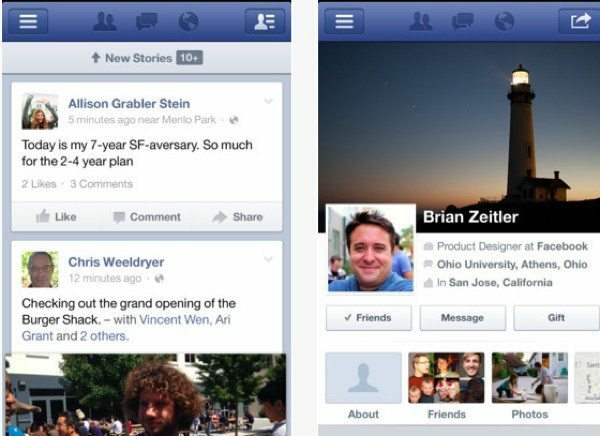 The Facebook iOS update does not however offer the new Facebook Timelines feature that was unveiled this month and is said to be arriving in the next few weeks. You can download Facebook on iOS from iTunes here, or of course if you already have it you will receive the update free. Have you already updated to version 5.6 of the iOS Facebook app? What do you think of the changes made? Let us know by sending your comments to us.